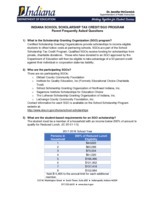 The School Scholarship Tax Credit is available for individuals or corporations who would like to donate to scholarship-granting organizations (SGO). A certified SGO provides tuition scholarships to income eligible students attending a partnering K-12 private school. The LaGrange County Community Foundation is a qualified SGO and can receive private, charitable donations. Individuals or corporations contributing to an SGO are eligible to take advantage of a 50 percent state tax credit. The donated funds are then distributed to partner schools for families that meet income and other requirements. While there are no limits to how much a donor can contribute to a qualified SGO, the entire tax program cannot award more than $12.5 millions credits in the state's fiscal year (July 1, 2017 - June 30, 2018). There is no limit to how much a donor can contribute to a qualified SGO; however, the entire tax program cannot exceed more than $12.5 million in in credits in the fiscal year (July 1, 2017 - June 30, 2018). There is no cap on the number of credits a donor can receive as long as the credits are available. Can I make a specific donation to an SGO for a specific school? Yes. There are no restrictions on a donor designating the use of his/her gift for a specific school. Can I make a donation for a specific student? No. If a donation is made on behalf of an individual student, that would be considered a tuition payment - rather than an SGO donation - and thus would not be eligible for the tax credit. Are there rules regarding the size of a scholarship award? There is no minimum amount that an SGO must award to an eligible student. 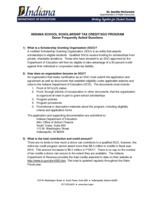 However, an SGO award must be at least $500 in order for that student, or the student's sibling, to qualify for a Choice Scholarship under the previous SGO Award Pathway.